Archer AM1 Series ISO mill type cylinders from Berendsen Fluid Power are the first choice for a well engineered, heavy duty hydraulic cylinder for a variety of industrial applications. They are designed with the aid of computer by our Technical Services Group, and manufactured in our custom built cylinder manufacturing facility in Newcastle. Manufactured to ISO 6022-1981 “Mounting Dimensions for 250 Bar Single Rod Cylinders” standards as specified by the Steel industry. The cylinder barrel is manufactured from high strength ST52 cold drawn seamless steel tube and hollow bar grade 750v. The bore is precision honed and polished to a micro finish. Both the gland and piston incorporate bronze impregnated Teflon wear rings to eliminate metal to metal contact and provide maximum bearing durability and strength. Both the gland and pistons use the latest technology in dynamic, self-adjusting seals, all designed to fit into ISO 5597-1990 housing dimensions. The piston rods are machined from high strength carbon alloy steel and hard chrome plated and ground to a micro-finish. 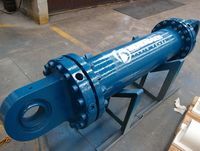 The gland arrangement incorporates a heavy duty piston rod scraper to ISO 6195-1986 housing dimensions to prevent contamination from entering the cylinder. Cylinder bolts are high tensile grade 12.9 Unbrako socket head cap screws carefully tightened to the required torque for maximum strength and fatigue rating. All cylinders come standard with fully integrated, cartridge type cushion arrangements for smooth cylinder deceleration which also include an air bleed/pressure test point at each end. Ports: Standard ports are BSP Parallel up to 200 bore and SAE code 62 flange connections for up to 500 bore. We are able to offer other port configurations on request. Rod and Clevis: A full range of rod end clevises are available and include bearing options as well as male and female plain clevises.